Jalebis hold an immense sentimental value (or food memories as I like to call them) for the whole lot of us who grew up in smaller cities along with our grandparents in joint families. I remember the awesome winter breakfast of doodh Jalebi that would "make me strong "as per my grandmom (take that !!) Another jalebi food memory is of the 'khatti' thick n soft Jalebis that you get in village weddings in Punjab, I can still eat a kilo of those !! Then there's the painful Jalebi memory from Boston when I decided to team up with a friend to make and sell Jalebis on India day, when more than 10000 people (most of them Indian) visit the Charles river Esplanade. I ended up making Jalebis of over 50 kgs maida (that equals 2 large drums of batter), made a lot of money in the process but was left with a sore and unusable arm for the next three days!! All in all jalebis have an old connection that still holds strong. So every city I go to I find that one Jalebi wala that makes this divine gift like none does and trust me the non-metros beat the big city counterparts hands down. There's the late Yadav Ji Jalebis on Raebareilly road, Lucknow whose sons now inherit the recipe, then there is Gurudas Jalebiwala AKA the "Jalebi king of Amritsar", there is Motu Ram of Jodhpur whose wafer thin Jalebis are unbeatable and whose answer to all recipe-related questions is "there's no special recipe, its just the water of Jodhpur" !! 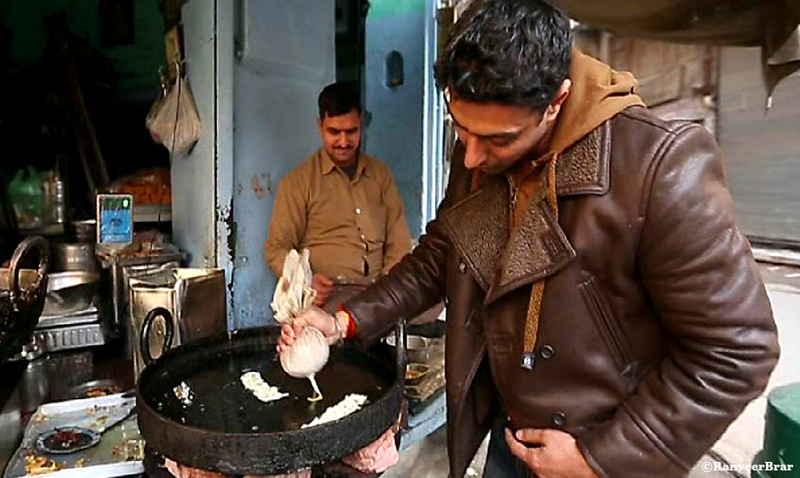 ; and then there is the old famous Jalebi Wala at the corner of Dariba Kalan in Old Delhi. The Story of this Jalebi wala is content from my forthcoming book, Food Fables - a collection of legends and interesting stories around food that have been passed down from generations. Around 1900, Nem Chand Jain moved to Delhi from Agra with a very young wife and 50 paise dowry and started a small rabri selling business, he found himself a small stall outside the shop of a benevolent Shamsuddin. His jalebi business gave him money and popularity first in the bustling jewelers neighborhood and then in Delhi, enough to buy a 76 room haveli in Gali Khazanchi. After partition, Shamsuddin's shop became the Jalebi shop and has stayed that way ever ever since.